What was your first set of knitting needles? This is probably a question whose answer will reveal your age, as there has been a distinct progression in the materials and shapes of knitting needles over the last century, a span which is likely to include even needles inherited from long-departed relatives. One hundred years ago, long steel knitting "pins" (usually what we would call double-pointed) were the most common tools, almost always in tiny gauges. Fifty years ago, aluminum straight needles with a cap on one end, incised with the number size of the needle, were the standard - smooth but not slick, it could be a real struggle to slide stitches along these needles. Circular needles made of nylon extruded in a single length of fatter tip and slimmer cable had also made it to market, but their stubbornly coiled cables had a few kinks to work out, pardon the pun. 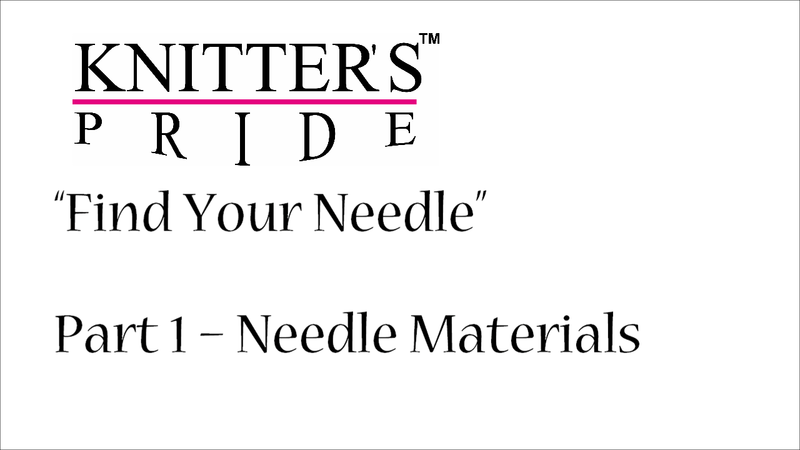 Over the last twenty years, there has been an explosion of materials, shapes and styles of knitting needles - here at Knitter's Pride, we use diverse materials ranging from rosewood and bamboo to chrome plated brass, acrylic, and carbon fiber, all of which are available in single point, double point, fixed circular and interchangeable needle options. With all of this diversity, however, the stereotype of two sticks and a ball of yarn is still the universal short-hand for knitting needles, even though many knitters knitters leave straight needles behind for the comfort and convenience of an interchangeable set of tips and cables once they have mastered the basics. Shadow Chevron Stitch on single pointed needles - click for free washcloth pattern at VeryPink.com. Single pointed needles are perfect for certain projects, like scarves or dishcloths - but they have limitations. If you are knitting a garment for anyone beyond toddler size, it will be difficult to comfortably fit your WIP onto a straight needle. Even it you are using a longer 14" length, the width of your garment will most likely be larger than that, even if it is going to be knit in pieces and seamed together. Your wrists are going to bear the weight of the garment’s fabric as it grows and you try to keep those stitches on your needles - ouch! Smaller items like hats, mittens and socks can be knit flat and then seamed to create a three-dimensional piece, but most knitters prefer to work in-the-round. Double-pointed needles (DPNs) are a good solution for seamless knitting, but they are a bit fiddly, particularly at the beginning of a project, and they are very easy to lose down chair cushions or in the airplane aisle. So go circular! 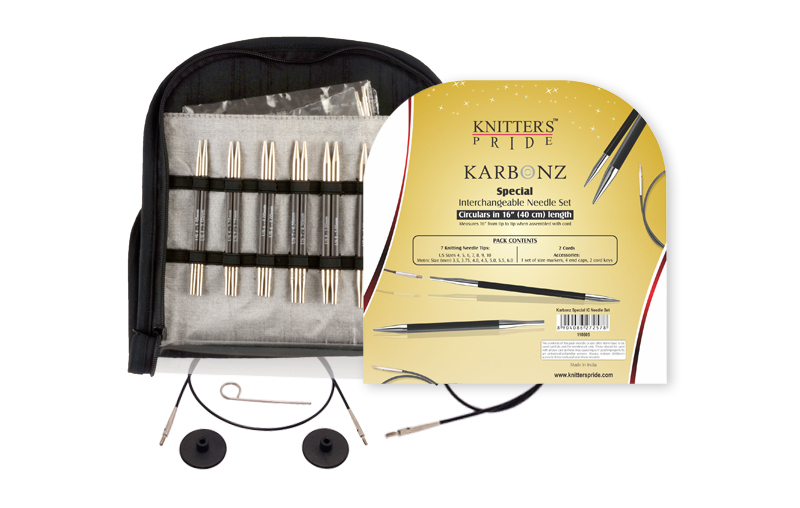 Our interchangeable needle sets provide knitters with a wide range of versatility so that the knitting experience can be customized to each project’s size, yarn, construction technique and stitch pattern. You can knit anything, flat or round, from the tiniest baby bootie to a lace Pi shawl, on a circular needle with the right cord length. When you knit a project on a circular needle, the cord bears the weight of the project while your wrists are free to create the stitches. 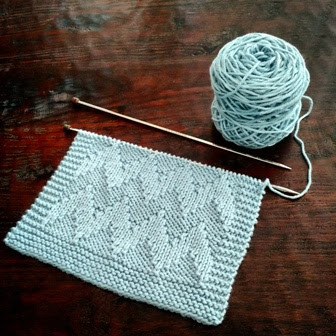 When you’re done knitting for the day, you can slide the project onto the cord and avoid the row of stretched stitches that a work-in-progress develops on straight needles. Once your project is resting on the cord with the tips dangling, your project is portable; you are less likely to lose either your stitches or a needle. The ever-popular mitered square scrap yarn blanket using Karbonz interchangeable needles. How do you knit flat on a circular needle? Imagine your circular needle is a flexible straight needle with a cap on one end. First, cast on your stitches as you normally would. Next, instead of picking up a second needle, bring the other tip around to the right end and begin knitting. When you reach the end of the row, drop your working tip and turn the entire work around so that your working yarn is at the right end, ready to go. Bring the other tip around and knit on! Now for the mysteries of knitting in the round. First, let’s think about why this is a great way to construct knitted garments: put simply, the human body is not flat. Creating tubes with our knitting is the best way to accommodate arms, legs, heads, necks and torsos. Many knitting patterns employ this technique - take, for example, the classic Icelandic lopapeysa. The body is a tube; each sleeve is also a tube, and at the top they joined them together (sleeve, torso, sleeve) to knit a patterned yoke up to the neck and then bound off. The only seaming required is at each underarm! In-the-round projects on Knitter's Pride needles. Learning to knit in the round opens up all kinds of possibilities for your knitting. Once you understand what’s happening in your knitting, it’s very easy. 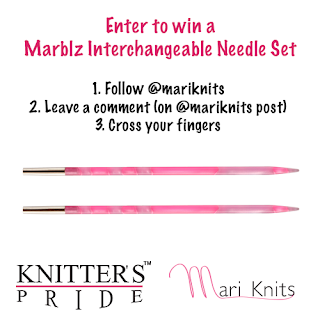 Begin by assembling the right combination of tips and cord from your interchangeable needles. 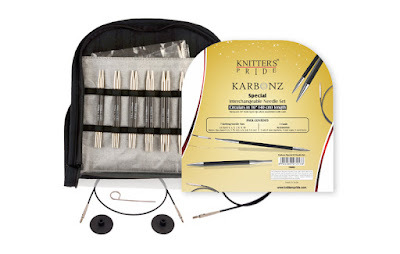 For example, a hat or cowl is generally going to be best on a 16 inch cord; you really need the shorter tips of a Knitter’s Pride Special interchangeable set to comfortably form a 16 inch circle (shown below is our Karbonz Special Interchangeable Set). An adult sweater will be best on a 24-inch or 32-inch cord, depending on yourstitch count. To begin, cast on the number of stitches your pattern specifies. Now comes the crucial step. Most patterns will now have a line that reads something like “Join to knit in the round, being careful not to twist.” What this means is that you will bring the end of the cable where your working yarn is back around to the beginning of your cast-on. Once you knit the first stitch of the cast-on with the working yarn of the last stitch of your cast-on, your work is joined in the round. But is it straight? If it is twisted, the only solution is to start over, so you want to make sure that it is straight. One way to do that is to knit a row flat before you join so that you have enough fabric to see that you have an untwisted tube below your needles. It will require a one-stitch seam to finish your garment at the end, but it is worth it! And now the real magic of knitting in the round is revealed: If you’re knitting plain stockinette, you won’t purl again unless the pattern instructs you to purl for ribbing or some other textural effect. Knitting in the round creates a fabric where the “right” (or knit side, if you are working stockinette stitch) is on the outside, and the “wrong” (or purl side) is on the inside of the tube. Since you’re working on the outside, all you have to do is knit! It’s quick, it’s easy and it doesn’t require every brain cell you have, so it’s great for social or movie knitting. Once you’re comfortable with knitting on circular needles, you can add to your repertoire of knitting techniques with Magic Loop and other specialty applications. In a future post, we will look at advanced uses of circular knitting needles! 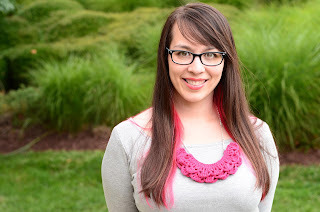 Today we feature an interview with Mari Chiba from Mari Knits, and her new Mystery Knit-Along and pattern. Mari re-learned to knit in the Peace Corps in Armenia, started designing while teaching English in China, and now designs in Raleigh, NC. She spends every waking moment working with yarn and fiber in one way or another. 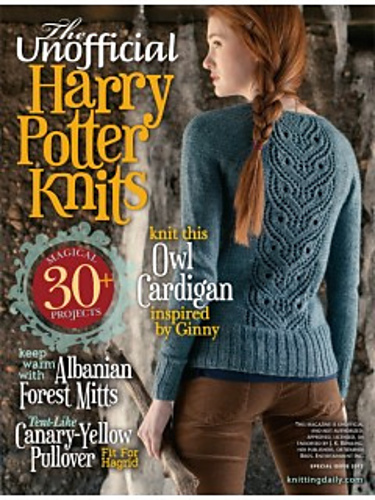 Her designs have been featured in Interweave Knits, Knitscene, Knitty, Twist Collective and other publications. You can find her on Facebook, Instagram, Ravelry, Pinterest, and Twitter; you can also visit her website. Can you tell us about your MKAL? I hosted a Mystery Knit-A-Long last year featuring Mountain Colors Perspectives Kit, and it was a huge success! I got a lot of really wonderful feedback about it, and lots of people asked me to host another one, but using the sport weight yarn. I was happy to oblige! Fun side note: I actually designed and knit this cowl in 2 days. I was a week overdue with my son last September, and really grumpy. I needed a positive outlet for all that energy, and this pattern is the result! The pattern is for a cowl, featuring some lace. I can't tell you too much, it's supposed to be a surprise! You can purchase the pattern on Ravelry here: 2016 Perspectives MKAL, and join the knit-along in the Mountain Colors Ravelry Group here. The MKAL starts on April 8th, and until then you can purchase the pattern and select yarn. 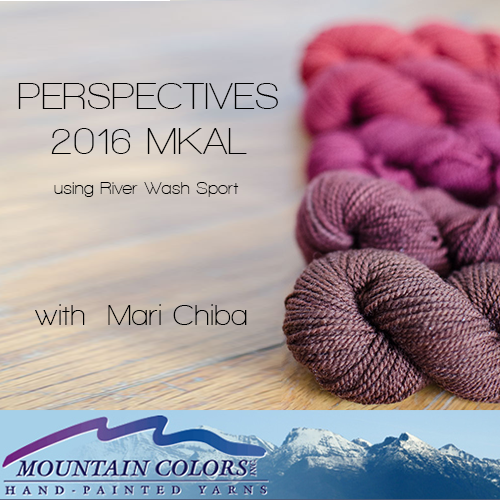 If you purchase the pattern by April 1st you'll automatically be entered to win a River Wash Sport Perspectives Kit! You can also learn about more prizes for participating in the MKAL in the Ravelry group. Who taught you to knit, and how did you become a designer? My mom tried to teach me to knit when I was young, maybe 8 or 9? I remember knitting what was supposed to be a headband out of neon acrylic variegated yarn. It had a lot of holes, and I never finished it. Fast forward a bunch of years to when I was newly graduated from college, and living in a small village in Armenia as a Peace Corps volunteer. There wasn't a lot to do in the winter, so I re-learned to knit. I got some help from online tutorials I would download to my flash drive from the internet cafe and some other volunteers, but mostly learned myself through trial and error. I started designing not long after I started knitting. It started by just adjusting other patterns because I didn't (and still don't) like to follow directions. That then went into making up my own patterns. Then eventually I started writing them down. What are your favorite patterns you've designed? I'm not sure, I can tell you the one that has brought me the most attention has been Ginny's Cardigan from The Unofficial Harry Potter Knits. The one I wear the most is probably Chibi Maruko. I have three of these cowls in different lengths, and I like the simple texture! The one that took the longest to come to fruition is the Canted Pullover from Knitscene Fall 2015. I originally sketched this idea back in 2013. I submitted it as a sketch to Blue Sky Alpacas, Brooklyn Tweed, Manos del Uruguay, and at least one other place that I can't remember. I was excited for it to finally become a real pattern and published for all to knit! 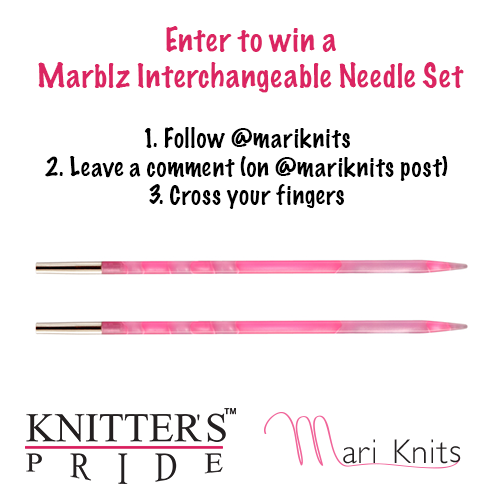 Head over to Instagram and follow @mariknits for a chance to win a Marblz Interchangeable Needle Set! Mari is also taking over the Knitter's Pride Instagram account, and you can see behind-the-scenes photos of her home office, design process, and her stash of Knitter's Pride tools!